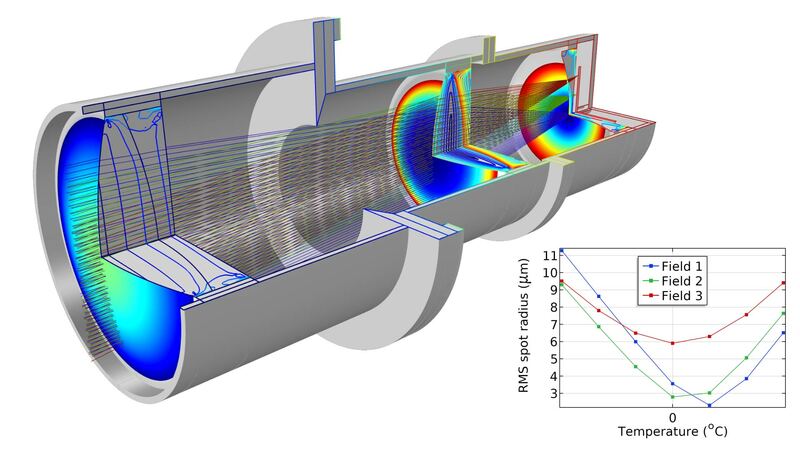 For users of the Ray Optics Module, COMSOL Multiphysics® version 5.4 brings a completely overhauled Part Library with better accuracy and new part variants, more robust intensity and power calculation for enclosed systems, and optical dispersion models, including thermo-optic coefficients. 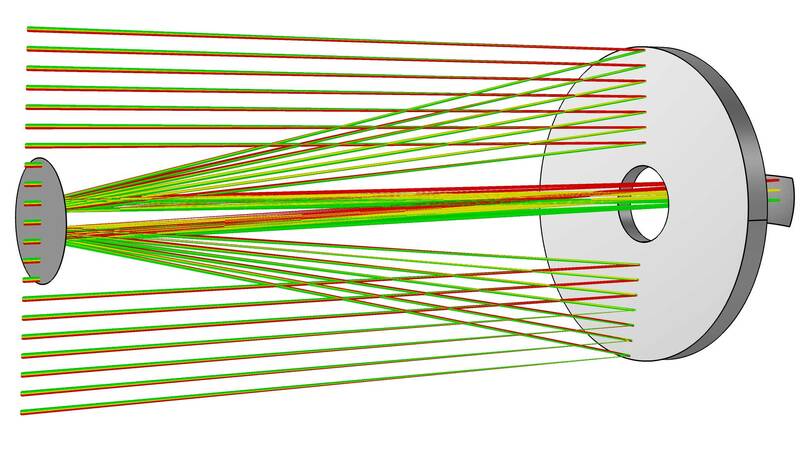 Browse all of the Ray Optics Module updates in more detail below. 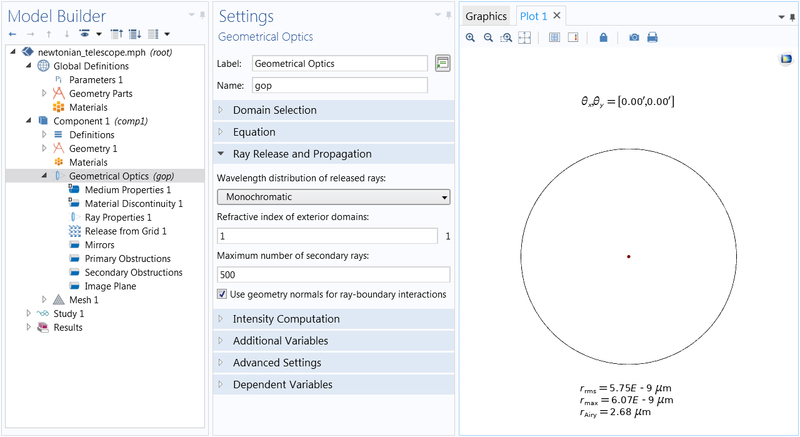 The Part Library for the Ray Optics Module has been completely overhauled in COMSOL Multiphysics® version 5.4. In the new parts, each reflecting or refracting surface is now a single boundary, whereas in previous versions, they were often subdivided into quadrants. This helps you to more easily assign boundary conditions and set up surface plots, because the selections now involve fewer entities. The new parts also reflect and refract rays much more accurately. In addition to improvements, there are also new parts available, including the Spherical Mirror 3D, Rectangular Planar Annulus 3D, and Elliptical Planar Mirror 3D. New parts available in version 5.4 (left). 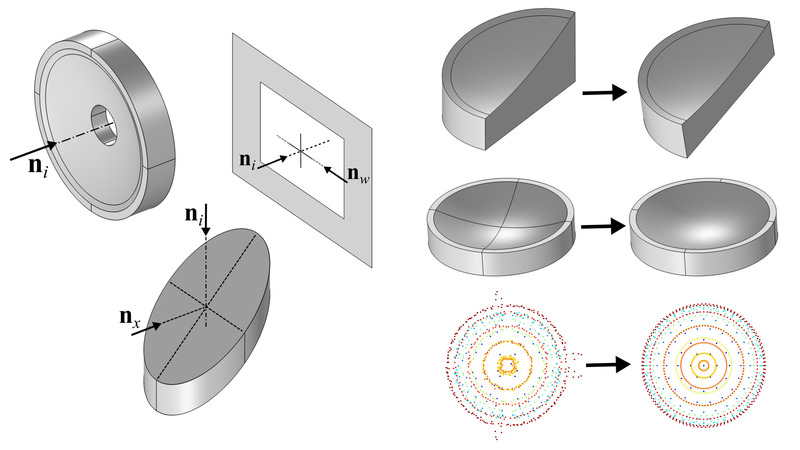 New "standalone" variant of the Conic Mirror Off Axis 3D (top right). Most lens and mirror parts no longer have internal edges on the reflecting or refracting surface (middle-right), leading to more accurate ray and spot diagrams (bottom-right). New parts available in version 5.4 (left). New "standalone" variant of the Conic Mirror Off Axis 3D (top right). 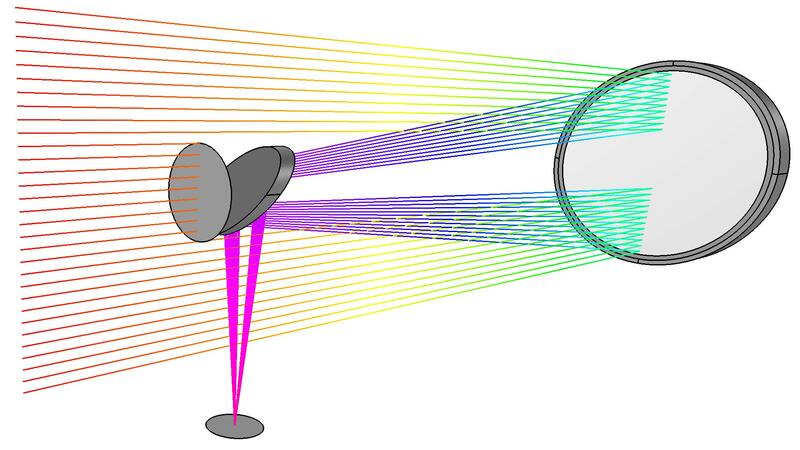 Most lens and mirror parts no longer have internal edges on the reflecting or refracting surface (middle-right), leading to more accurate ray and spot diagrams (bottom-right). Built-in optical dispersion models have been added to give a convenient way to specify wavelength-dependent refractive indices. The standard dispersion relations used by several glass manufacturers have been included, such as Sellmeier coefficients. A temperature-dependent Sellmeier dispersion model is also available, which defines the refractive index as a function of both wavelength and temperature. The calculation of ray intensity and power has been significantly improved in COMSOL Multiphysics® version 5.4. The new implementation is much more robust than in previous versions. This is especially true for enclosed systems where rays can be reflected or refracted many times in a small volume, and the wavefront is not well defined. There is also a new option to compute ray power, but not intensity, which is useful when the calculation of deposited heat sources is relevant even if the visualization of ray intensity is not. Screenshot of the new option to compute ray power. From the Solar Dish Receiver model. Screenshot of the new option to compute ray power. From the Solar Dish Receiver model. The effects of attenuating or gain media on ray intensity are modeled much more accurately in version 5.4 than in previous versions of the software. The equations that lead to exponential growth or decay in homogeneous absorbing or gain media, respectively, have been refactored so that they are less sensitive to the size of the time step taken by the solver. This can lead to much faster performance, because you can trace rays through absorbing or gain media using extremely large time steps, or optical path length intervals, in the Ray Tracing study settings and still get a very accurate solution. You can see this functionality in the Thermally Induced Focal Shift model. When releasing polychromatic light, you can now choose to assign distributions of either frequency or vacuum wavelength. Previously, it was only possible to specify frequency. 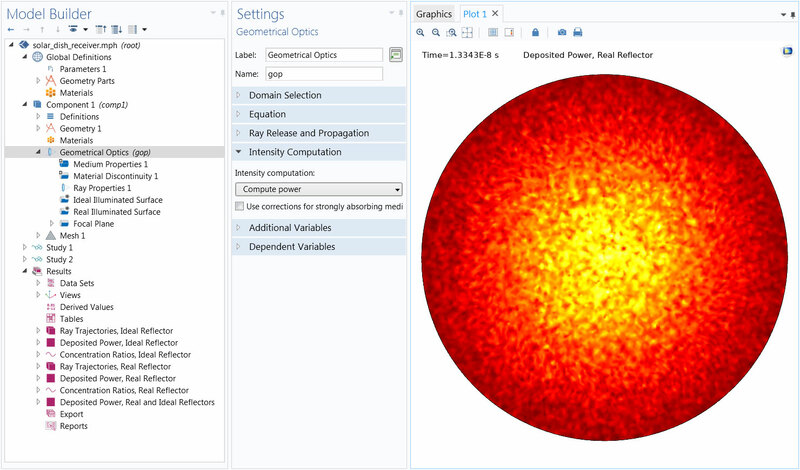 Screenshot of the new option to specify vacuum wavelength distributions, from the Distributed Bragg Reflector tutorial. 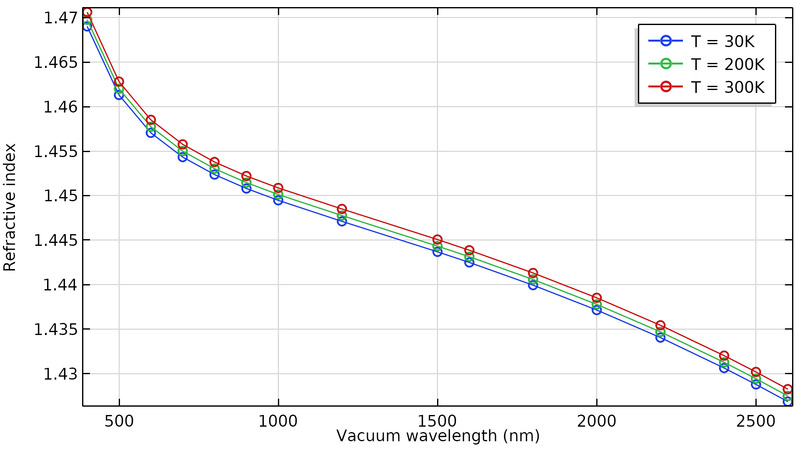 Screenshot of the new option to specify vacuum wavelength distributions, from the Distributed Bragg Reflector tutorial. A new option is available to control how surface normal directions are computed in the Geometrical Optics interface. Accurate calculation of surface normal directions is essential to high-fidelity modeling of optical systems. You can now choose to apply ray-boundary interactions, such as reflection and refraction, using either the normal to the boundary mesh or the normal to the parameterized geometry (if available). This option has no effect if any phenomenon in the model causes the mesh to deform, such as structural deformation due to external loads or thermal stress. Screenshot of the new option to use geometry normals, from the new Newtonian Telescope model. The RMS spot size for zero field angle is negligibly small, suggesting that the discretization error is minimal. Screenshot of the new option to use geometry normals, from the new Newtonian Telescope model. 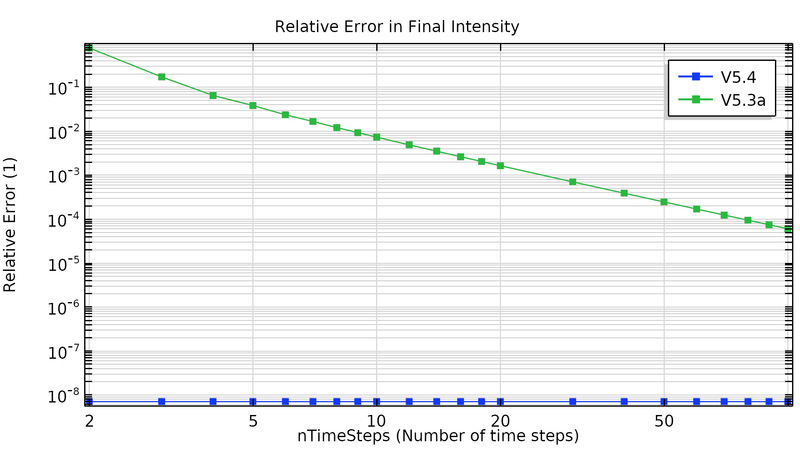 The RMS spot size for zero field angle is negligibly small, suggesting that the discretization error is minimal. 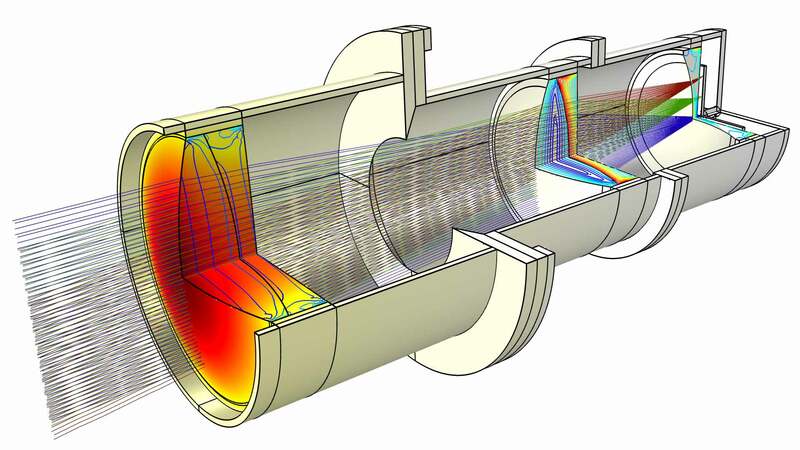 COMSOL Multiphysics® version 5.4 brings four new tutorial models. In this tutorial, the effect of placing the Petzval lens assembly inside a thermal vacuum chamber is examined. The front of the lens is exposed to the external warm room via a pair of windows. This view shows the thermal gradient within the lens and the von Mises stress contours. This tutorial demonstrates the effect of changing the temperature of a simple lens and barrel assembly. The displacement field on the lenses and barrel is shown together with the von Mises stress contours. A parametric sweep is used to compute the spot size as a function of temperature. The Newtonian Telescope model has been substantially revised in version 5.4. Incoming light is first focused by a conic mirror and then redirected by an elliptical planar mirror. The on-axis image quality is effectively perfect. The Hubble Space Telescope uses a Ritchey-Chrétien geometry to focus rays onto a curved image surface. Here, the color expression indicates the field angle; three different field angles are used to generate on- and off-axis ray and spot diagrams.